Last year I encountered a situation where a well-known and respected boatyard had added a bonding system to a 42 (12.8m) motor yacht. They used #8 wire for the system and did a nice and tidy job of it. The bonding system included a wire to the metal housing for the bow thruster. What the yard didn’t consider is that the bonding wire was now also acting as the DC grounding wire for the bow thruster housing (not to be confused with the DC negative cable). So when the bow thruster motor developed a short, the #8 bonding wire tried to carry all of that current. That started a small fire, which extinguished itself. Fortunately, the bow thruster was used only for a few seconds, which prevented it from burning the boat up. But the #8 bonding system wire couldn’t carry enough current to blow the 250-amp fuse. Without looking up the reference in [American Boat & Yacht Council Standard] E-11, I believe that the DC grounding wire should be no smaller than one size less than the DC current carrying cables, which I recall as being 2/0 on this particular bow thruster installation. The point of this comment is that any wire connected to the metal housing of equipment or device that has a DC electric motor (or to an inverter) needs to be large enough to carry the DC load in case of a short so that the fuse or circuit breaker can do its job. I see this mistake quite a bit, and surprisingly get a lot of pushback from yards and techs who just don’t understand the requirement. Derek Rhymes, NAMS-CMS & SAMS A.M.S. Thank you for sharing this note and this story, it possesses valuable lessons to be sure. At least one thruster manufacturer, Side Power, prohibits interconnection of thruster drive legs to the vessel bonding system. They do this for corrosion purposes, and they maintain ABYC compliance in doing so because their electric motor is double insulated; i.e., the chassis isn’t connected to DC negative and the drive leg is isolated from the motor. The highlights are mine. Based on this language, bonding wires should not be connected to current carrying parts: If the chassis of the gear, thruster or otherwise, is common with the DC negative, then it should not be bonded. In this case, if the DC negative and the drive leg were isolated from the motor chassis, then one could argue the bonding wire wasn’t needed because the drive leg is protected by its own anode, and it isn’t connected to the DC negative (I’m speaking hypothetically because I don’t know the design for certain; however, I do know this is how Side Power sets up its systems). If the short you mentioned was a short between the positive supply cable and the thruster chassis, and the chassis was non-current carrying, then the bonding wire became the return path. It would quickly be overloaded and overheat. Thus, one could argue that the addition of the undersized bonding wire actually caused this problem. If the chassis was not isolated, when the short occurred the DC negative cable would have carried the fault, blowing the fuse. If, on the other hand, no bonding wire was present and the drive leg was common with the motor chassis and it became energized with DC positive voltage, it would have led to rapid stray current corrosion, to the point where it could have compromised watertight integrity. I frequently encounter this undersized bonding wire issue on engine and generator blocks, to which small bonding wires are often attached. If primary DC negative cables become compromised, or are disconnected, these small conductors can be called upon to carry cranking or charging (or fault) current, quickly causing them to become overloaded. Or, if the DC positive cable shorts against the block, these wires, along with the larger DC negative cable, will carry the fault current, again potentially overheating. The stray current corrosion issue aside, if a chassis is energized with 12 or 24 volts and isn’t bonded, it will remain in this state until inadvertently grounded, when the path to ground is completed with a piece of gear, such as a spare anchor or aluminum tender paddle. 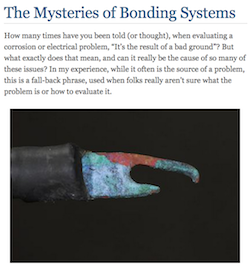 The results could be spectacular or even life threatening if it leads to a fire, driving home the need for thorough and proper bonding/DC grounding. It’s an interesting conundrum. Ultimately, bonding/DC grounding wires must be able to carry fault current from the device to which they are attached, and if in doubt one should install a bonding wire capable of carrying this current.